My friend Jiri sent me this adorable puppet video by singer songwriter duo Evelyn Evelyn. Your children will love it. So will your inner-child. If you're reading via email or RSS, click to watch the video. Big and strong and gentle and intelligent, intelligent. And an elephant to ride. You’re sad and in a cage, but that’s irrelevant, irrelevant. On a friend of such of great size. But that won’t do for me you understand. Other kids have hamsters, other kids have frogs. But the pet for me is something much more grand! Riding on your back I’m in my element, element. When you’re on a pachyderm. Life’s not so bad, it’s swell of it to give me such a friend. Oh, elephant, elephant, I’m with you to the end! Lyrics ©2010 by Evelyn Evelyn. Get the entire album instantly HERE. After reading their website and doing some more research, I realized that Evelyn Evelyn isn't a children's musical group. Their site describes them as "a songwriting duo performing original compositions on piano, ukulele, guitar and accordion. The sisters are parapagus tripus dibrachius twins, sharing three legs, two arms, three lungs, two hearts and a single liver." They are twisted musical theater. Now I like them even more. To me, this version of the song is even better. Now it should be obvious that I don't condone riding elephants in real life, but the "conjoined twin" duo of Amanda Palmer and Jason Webley aren't going for realism as much as they're expressing the imaginativeness of children. Indeed, there is so much we can learn from befriending a pachyderm. Lualeni was my 2nd foster baby elephant from the Sheldrick Wildlife Trust. She was found abandoned, a secondary victim of ivory poaching, as it was suspected her mother was killed for her tusks. She had tried to find protection with other elephants, but none would adopt her. Humans intervened and adopted her instead. Lueleni was emotionally devastated and was slow to heal from her deep grief and depression from being orphaned. In 2005 (about 7 months after I began fostering her at the trust) I got to meet her. In the above photo, she was marching back home with a little elephant smile on her face after playing all day. She was just beginning to recover from her trauma. Keep in mind that although she already looks big in the photo below, she was only a one year old infant. It was such a treat to say good night to her as she was settling into her holding pen with her keeper for the night. Another year later, Lualeni had really turned a corner in her rehabilitation, thanks to the elephant angels at the Sheldrick Wildlife Trust. It was an absolute thrill to see a video segment that BBC Television had done on her. Take a moment to watch it. It's very inspiring. Lualeni has continued to thrive over the last 5 years. She's been gradually reintroduced to the wild and been bonded with a new herd made up of other rehabilitated orphans. I cannot express enough how much I esteem the Sheldrick Wildlife Trust. Please take a look at their website and consider fostering your own orphaned baby elephant. Photo copyright Kunal Kamlesh Shah. Photographer's note, "The idol is of Lord Ganesh who is followed by a lot of Indian Population. During the 10 day festival, the God is offered prayers, donations and prasadam (sacred food.) After the 10th day, the clay idol is immeresed into the sea. The immerssion procession lasts for about 18 hours, where the lord is pulled by a hand wagon and the journey starts from city centre and ends at the sea side where it gets immersed. The procession has huge orchestras (locally known as Nashik and Pune Dhol) and people dance, sing praises of their favourite lord. This festival is celebrated every August-Sept period. 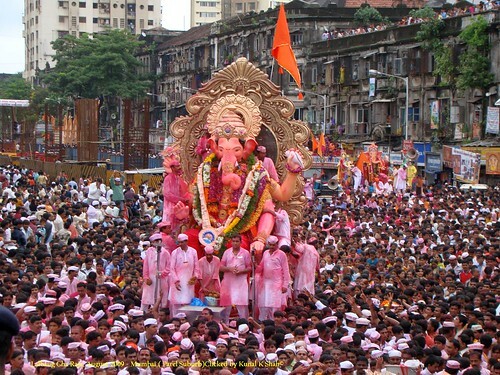 GANPATI BAPA MORIYA. Place: Lalbaugh Suburb, Mumbai City." If you are reading via email or news feed, click to watch the video. September 11, 2010 is Ganesh Chaturthi (Ganesh's birthday.) Here is a video I made for the occasion. It's also suitable as a video birthday card for a friend. May you feel the loving presence of Ganesh on his birthday and on yours. Namaste. Forest officials rescued a one year old baby elephant from wetlands in Guwahati City, India today. No one knows how it got stuck underwater, but lots of people came out to watch the rescue efforts. News reporters caught it on video, so you can watch it too. Baby elephants are the cutest little things, but they sure get into a lot of trouble! The David Sheldrick Wildlife Trust, one of my favorite elephant rescue organizations in Kenya, will have a free photography exhibit at the Royal Geographical Society in London on September 6-10, 2010. Gorgeous elephants photos taken by photographers Joachim Schmeisser, Michael Nichols and Robert Carr-Hartley will be on display. Click here for an online preview of the elephant photos at the Guardian UK newspaper.